Mosaic cork tiles are a beautiful alternative to other types of mosaic tiles (wood, porcelain, stone, or ceramic) or to traditional cork tiles (floating or glue-down). They require a bit more work to install them because of the need to caulk or grout around the cork disks, but the effort is well worth it. It’s a beautiful look for any home or office. To make the biggest impact upon the look and feel of your home, most people think that they have to remodel the entire home, including changing the paint color, furnishings, curtains, floorings, and more, but this is not usually the case. A simple way to update the look and feel of a room may be as simple as changing the flooring. One way to add warmth and comfort to a room is to install mosaic cork tile. Cork is not as well known as hardwood, but it can offer the same warmth and classic style, as well as new comfort and texture. 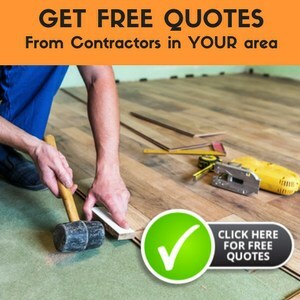 Check out our best reviews and comparisons of cork floor tiles here at The Flooring Lady! Mosaic cork tile can come as prearranged mosaic tile sheets or you can create a mosaic using several different colors of square cork tiles, whichever you prefer. Either way, you will be able to create a textural and eye-pleasing look that can enhance the rest of your home and room. Mosaic cork tile sheets are widely available that offer you a wide variety of mosaic looks that are easy to install and add to your home. No matter which way you choose to get the look of mosaic cork tile, you will find that it can give your floors new life and beauty that you will love. Installing mosaic cork tiles most often includes using adhesive, but not necessarily all of the time. Choose an adhesive that is made for use with cork, so that your floors will hold up to wear and tear for a longer period of time; my favorite is Bostik’s Best flexible urethane adhesive because of its durability under extreme conditions. Some cork tiles are a floating floor, which means that they click and lock together and are installed over a moisture barrier. No glue or nails mean that the floors “float” over the subfloor. Floating floors are easy to install and can give you a wonderful look for your room or home. Mosaic cork tile is not just for your floors, either. They can be installed in showers, as backsplashes, and on the wall with great results. As long as they are sealed after installation, they will hold up to water, dirt, and anything else. For showers, they offer excellent benefits, including offering a non-slip surface, an antibacterial surface, and they are durable and sound absorbing. Most people do not think of using them in their shower areas, but mosaic cork tiles can be an excellent choice over tile. Cork is also considered environmentally friendly because trees do not need to be cut down in order to obtain the cork. If you want a new look for your floors or are looking for a way to add texture and interest to your shower or wall, you will want to consider mosaic cork tiles. The tiles come in sheets are easily applied to an existing surface or you can create your own mosaic with cork tiles. Either way, you will add great beauty to your home with new style and appeal. Consider mosaic cork tiles to add style and value to your home today. We redid our master bath in mosaic cork tile and it is stunning. It flows well with the décor into our bedroom. There are so many different colors you can find. It’s perfect. And it actually looks so much better. Have had it for about a year now. For bathrooms, they are perfect. And I have a design as a backsplash in our kitchen. Looks wonderful. I’m looking into redoing our bath in mosaic cork tile as opposed to regular tile…especially for our shower walls. There are so many different options for styles and coloring, and it seems as if it’d be easier to clean and take care of than regular tile walls.